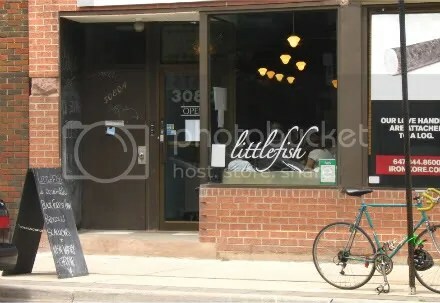 In direct contrast to our previous installment of Dundas Dining, the staff at Junction breakfast-place, Littlefish, know how to deal with a busy day. We arrived and there were no free tables. That had something to do with arriving at a brunch-centric restaurant at noon on a Sunday. Not being idiots, we didn’t really expect to get a table and were prepared to move on. We were informed it’d be no more than a fifteen minute wait and theyd bring us coffees to the waiting couch, if we wanted. We wanted. So we sat on the comfy but hideous blue couch and watched every single hipster from the Junction eat breakfast. The young folk were hipsters, the older yuppie couples were hipsters, even the families with young children were hipsters. 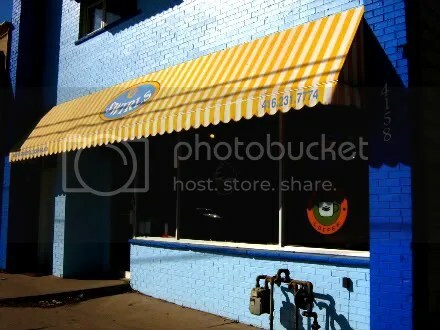 It was a hip place. The kids sitting across from us talked about Mogwai a lot. We waited for our coffees. The Beet is a place I’d been hesitant to check out for some time. I wasn’t sure exactly why, but I thought it had something to do with the logo. To me the logo says “hip and healthy urban eatery” which translates to run by pretentious hippies and/or overpriced bland and woody food. Sometimes it means delicious and not actually healthy food—but be careful you don’t dare say that in earshot of the people deluding themselves at the next table. 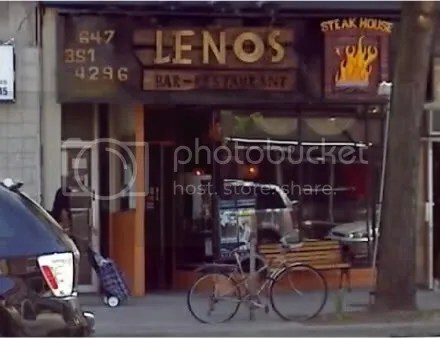 Mostly I was afraid the staff and patrons would all be wearing Birkenstocks, hemp jewelry, designer bike shorts and smarmy holier-than-though smirks on their faces which would prevent me from being able to keep my meal down. There was indeed some of that to be found. But since I myself was wearing Birkenstocks, I decided to let that aspect slide. My other preconception about places like The Beet is hippies provide bad service. Hippies by and large are defensive, angry people who tend towards flakiness. I should know. I’m a hippie. If I were a server, I would provide you with the worst service you’d ever experienced. So I have to admit I feel a little bad about what I’m about to write. There’s not much point in reviewing a place like Vesuvio Pizzeria and Spaghetti House. It’s been around for about a million (perhaps closer to 53) years and is a Junction institution. A good or bad review here or there isn’t going to make a lick of difference in their next 53 years of business. But here goes. As we walked up to the door we were greeted by the delicious smells wafting out the window of of their take-out pizza counter next door. It’s really quite amazing it’s taken me a year and half to enter Vesuvio because every time I walk down Dundas West my appetite is stirred by the aroma. I think they must have fans blowing it out onto the street. I think they also must add some kind of pheromone to it because the magnetic pull towards the door takes every ounce of my willpower to fight. Every. Single. Time. Just before we entered, someone in a group walking past us complained Vesuvio were just copying The Sopranos which apparently had a restaurant called Nuovo Vesuvio in it. One of them replied in that kind of know-it-all voice that this Vesuvio had been around since 1957. Upon stepping into the restaurant, it was clear some of the furniture had been around since 1957 as well. Actually, probably closer to 1987. A pair of faux-leather chez lounges near the window were quietly delaminating. The rest of the decor seemed fine though. A warm family atmosphere not nearly seedy enough for Tony Soprano to hang-out in. I’m not sure if there was even a booth in the back corner. Though the place was very busy (always a good sign), we were quickly seated by a friendly young boy who reminded me a bit of Even Stevens. I thought, Well, the service is pretty good. Of course, we hadn’t met our server yet. Not that she was by any stretch a bad server. She just wasn’t very attentive, prompt or personable. Whenever she did manage to eventually come around to our table, she seemed to treat us with an off-hand manner that implied we were merely an incidental facet of her job instead of actually being her job. Which, all things considered, was actually fine in my books. I don’t much care for insincerely gregarious and chatty servers. And she definitely wasn’t that. I was glad, however, I didn’t want my water refilled at any point because it wasn’t going to happen. A trade-off I’m ultimately comfortable with and as far as service in the Junction goes, this was pretty darn good. Though the Junction’s standard extra-long wait for the bill still applied and she didn’t even make eye-contact when she swept past to pick up my credit card. Which felt a little weird. Like she wasn’t going to come back with it. But what I came for wasn’t service and ambiance, it was to find out if the pizza could live up to its aromatic promise. It did, but only partially. The sauce certainly had the garlic and basil zing its smell advertised, but they could have been a bit more generous with it. The crust was also a bit of a disappointment. It was neither the fluffy, bready style crust of Pizzaiolo nor the gourmet, thin crust of Terroni. Instead it was a sort of dense, chewy middle ground. Not a terrible crust by any means, but also not as delicious as the toppings. I have to say, I’ve been more impressed with the cheap and absurdly named 1 Plus 2 Pizza and Wings take-away down the street. Mandi’s spaghetti carbonara was apparently an entirely different basket of eggs. She said it was delicious. This made me wonder if I shouldn’t have tried the chicken parmesan or another of their dishes instead. Perhaps pizza isn’t really their specialty after all. Also not a disappointment was our half-litre of house Merlot. It wasn’t, as is sometimes the case, disgusting but was pleasantly inoffensive. One of Vesuvio’s strengths, though, has to be the people watching. The joint was full of older couples with a hint of that old-world charm. They’d probably been patrons since the place first opened and there’s something about that vibe which is always great to drink in. And if the service and pizza is good enough for them, who am I to say different? Swirls falls a little outside of our usual Dundas Dining boundaries (roughly The Junction neighborhood), but it’s not too far past the Ghettobicoke line so I figure it’s fair play. Mandi and I both love cupcakes. So it was with a little trepidation we approached Swirls. It’s not too far from my place so, if it were the heavenly cupcake experience it threatened to be, it’d be game over for us. We may as well start stocking up on insulin and acai berries. Luckily, Swirls was merely “meh”. Which is always odd for a restaurant or bakery which specializes in one product. 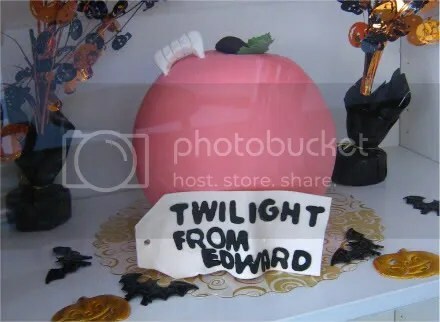 If you’re a cupcake bakery, it’s completely fair for your patrons to have lofty expectations of your product. Which, frankly, I did have of my Still-a-Vanilla cupcake. So when the buttercream icing seemed more like whip-cream out of a spray can and the vanilla cake was a bit rubbery, I have to say I had not choice but to be a bit let down. I did ask myself if this was a case of my expectations being too high. I think I would have been a little more forgiving if cupcakes weren’t their specialty, but even so I’d have to rank this cupcake as just on the high side of average. Mandi got the Red Velvet which was a better cake, but not as “red” as you’d expect. It did have a slight rosey tint to it. It was brown. The sign also said it was supposed to have cream cheese icing which she said it clearly didn’t. As we left, we noticed they were putting out an Oreo cupcake which appeared to have proper buttercream icing. It looked absolutely delicious. Maybe it was. It made me doubt my cupcake had buttercream icing on it at all and I was right in thinking it was merely whip-cream out of a can. As we were leaving we also noticed Swirls apparently makes fondant laden art cakes as well. We think that’s the apple from the book cover. One thing that was really fabulous about our visit to Swirls was the coffee. One of the best Americanos I’ve had on Dundas, bar none. Also the small size is apparently huge. But in typical Dundas Dining fashion, there has to be some awkwardness in ordering. You need to place your coffee order with someone at another counter entirely from where you place your cupcake order. Then they tally your coffee on a calculator which they slide over to the cupcake people. Really? That’s the best way to do it? There’s also the option, the girl informed us, to pay them each separately. Though why they’d think anyone would ever want to do that never came to me. True, it would be more awkward and be slightly worse customer service which is the ideal in Dundas West restaurant culture, but I can’t really see the advantage. The coffee was well worth the awkwardness. The cupcakes, not so much. 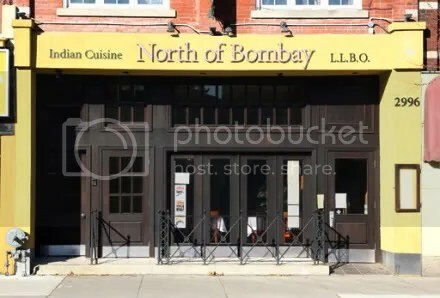 North of Bombay, one of four Indian restaurants in The Junction, has one of the most confusing entrances of any restaurant I’ve ever seen. Two sets of completely reasonable looking doors. Luckily, I’ve spent over a year staking the joint out so we didn’t make the mistake of trying to open the wrong set of doors. Also luckily, we were seated where we could watch people make that exact mistake. And a final piece of luck, a slight embarrassment with choosing the wrong set of doors is bound to be about the only drawback to your visit to North of Bombay. We started with some amazing vegetable pakoras. These orgasmic little bundles of deep-fried delight were practically a meal in themselves. I dare say they performed several positions of the Kama Sutra on my tongue before sliding easily down my throat. After that divinely sensual experience of greasy starch, we shared a chicken vindaloo which leaned towards the tomato side of vindaloo and entirely away from the potato end of the spectrum. It was a nice change from the “this is just our darker, hotter curry” school of vindaloo—a school I’m a big fan of, mind you—which you normally find in Toronto. Yet it wasn’t as amazing as the pakoras had been. It was merely a very good vindaloo. The naan bread was also top notch, clearly made from scratch, and authentically delicious. But speaking of authentic, there were oddly no Indian beers available. I don’t believe there were even any IPAs on the list (Keiths sure as hell doesn’t count). So we had Guinness, but from bottles, sadly, not on tap. The staff were competent, helpful and pleasant. There was nothing, really, to complain about (aside from the beer menu). One of our better Dundas Dining experiences. 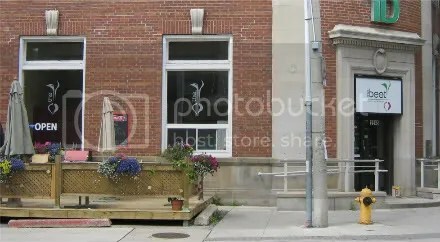 One of the appeals of Dundas Dining in the Junction is dodgy atmospheres and awkward interactions with the wait staff. You always have a story to tell. Which is important when you’re blogging restaurant reviews. 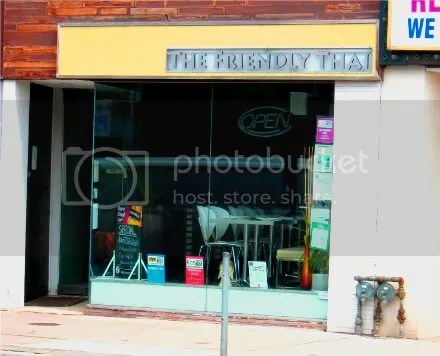 sadly, The Friendly Thai offered us no stories. The atmosphere is slick, modern and hip and the staff professional. Unless I wanted to nit-pick, I couldn’t really fault our waiter. If I did want to nit-pick, which I don’t, I might suggest he was a smidge too attentive at the start of the meal and a little too inattentive at the end. This was probably due to us being the only people besides himself in the restaurant at the time (it was early in the evening). What else was he going to do but be attentive? Once the six o’clock shift showed up, their attention was focussed on Christmas staff schedules. But I said I didn’t want to nit-pick. They were loud about it though. But not too loud. Mandi feels bad for the staff that weren’t there to be in on the discussion though. She feels like they were getting screwed. As I mentioned, The Friendly Thai is hip and modern in decor. It has a little of the feel of a lounge with only a single dragon and some bamboo to give the place a hint of the Orient. They were playing The Stills instead of the usual Exotic Sounds of Thailand type CD which was a little weird, but since I’d forgotten I rather like The Stills, I didn’t mind. I’m not sure why we look at menus at Thai restaurants because Mandi always gets the Pad Thai and I always get the Green Curry, but we did look at the menu and it had all the usual suspects on it. A few weeks back we went to Baan Thai and had the same thing. You might remember, my curry had frozen vegetables on it. This curry was made with fresh vegetables. It wasn’t as spicy though and the coconut sauce was perhaps a shade too thick and rich. It was still good though and lacked a giant pile of canned bamboo shoots, which I abhor, and Baan Thai excels in. How did Mandi’s Pad Thai compare? “They’re both fine. It’s fine. I think I was more impressed with Baan Thai because my expectations were so low. I feel like Pad Thai is kind of meh always.” Fair enough. The bottom line is The Friendly Thai is as good a Thai restaurant as you’re likely to stumble upon in Toronto (by my experience) as any. A safe bet. But not the best Thai you’ll ever have. And no stories to tell your friends, just a pleasant time. You are currently browsing the archives for the Dundas Dining category.